Jude Fry works in Zurich at PHOCUS Services, part of the rapidly growing, independent, Fishawack Group, and today is working from her home beside Lake Zurich. Jude took 10 minutes out to chat to me about her journey into MedComms and what a typical day is like. 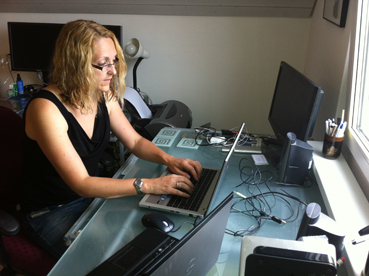 And here she is finalising some work after talking to me and before she heads off for lunch. Apparently that will be enjoyed outside in the sunshine and whilst looking out over Lake Zurich! This entry was posted on June 12, 2013 at 11:30 and is filed under Home working, Work Life Balance. You can follow any responses to this entry through the RSS 2.0 feed. Both comments and pings are currently closed.